Here is a repeat Tales post first published in 2013. To take material or an original idea from another author and claim it as your own is considered to be unethical and maybe plagiarism. But in classical music, to take a theme or an idea of music from another composer and then to quote [use] that theme and develop it in your work is considered as honoring the original composer. 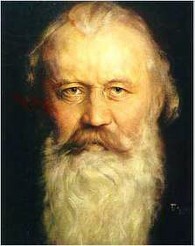 The great German Romantic composer Johannes Brahms honored many of his fellow composers by using their themes and employing them in his many theme and variations pieces. Brahms composed variations on themes by Handel, Haydn, Paganini, and his mentor and friend Robert Schumann. Johannes Brahms was a brilliant composer in his own right and did not need to take musical ideas from other composers because of a lack of his own original music ideas. He did so because of his love and respect of these composers and he showed that adoration by developing their original themes with his variations to make many pieces of great beauty. In the theme and variations mode, the piece will always start with the original theme, then have numerous variations of that theme and usually return to the original theme in the final variation. My favorite Brahms variations is his "Variations on a Theme by Haydn". The theme of Haydn is the St. Anthony Chorale. St. Anthony Chorale was a hymn tune [by unknown traditional composers] that Haydn used in his Divertimento #1 in Bb Major. It was the second movement of that divertimento-andante. So, you see while Brahms borrowed it from Haydn, Haydn also borrowed this hymn for his use. Brahms variations has 10 movements, starting with the Chorale St. Anthony theme in andante and the finale [with the original theme repeated at the very end] andante. Please turn up the volume to listen first to the St. Anthony Chorale theme Haydn used in his divertimento and then Brahms variations on that theme by Haydn. You will hear how the original theme used by Haydn is so beautiful and how Brahms takes that beautiful theme to develop it into an even greater beautiful piece of his own. Michael, I know this theme well. As a member of the Pasadena Christian School choir, I sang it in fifth grade to the words "We, Thy people, praise Thee, Praise Thee, God of all creation!" I still have the LP. You brought back fond memories today, and for that I sincerely thank you. Thanks Dave... That is an interesting story--glad it brought back great memories. That made it worthwhile for me to do it!! Blessings Dave. interesting to hear the differences from the organ to the full orchestra...enjoyed both tremendously:) thx Mike! You're welcome Jill! Thank you for your comments! This is one of my all-time favorites!! Love it! Thanks for relaxing music while I work on a Saturday afternoon. I'm glad you like it Joel. Thank you! !